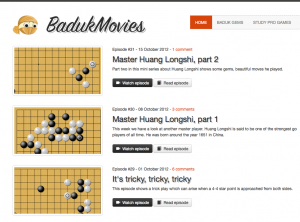 In March 2012 Peter Brouwer 6D and Kim Ouweleen 4D (NL) set up a website: http://www.badukmovies.com. So far they have published more than 30 baduk videos. Every Monday they publish a new episode. The videos are short, about 10 minutes, and cover all kinds of topics: josekis, fuseki, professional players, tesujis, trick plays etc. There is even bonus material, they collect beautiful moves of professionals in their “Baduk Gems” section. What’s more, you can download or browse through their extensive collection of over 48.000 pro games. Definitely worth a look! The highest level of Go Game style! Igor Grishin: Timur, let’s give a list of the Internet sites, that can be useful for beginners and strong players or will help them to find answers to the questions we haven’t looked through here. Wish you all the best success in mastering the wisdom of the game of Go. Wish you success in the path of Go. “I remember hearing a story about a man explaining what go is to another man at the tournament.